Ad-hoc work groups have steadily increased in popularity over the past few years. Ad-hoc groups allow individuals to work on a project as a group that shares responsibilities, assignments, the gathering of information, and other tasks involved. These groups form dynamically to achieve a shared outcome. Often times, ad-hoc work groups are set up for projects that are too large to be handled individually, but will reach a definite end at some point. These convenient, collaborative work groups are used by organizations, advisory boards, committees, and even Fortune 500 companies. Basically an ad-hoc work group can be set up for any project or task. Some of the popular work groups I’ve seen include editing and writing collaboration, marketing project groups, event planning work groups, medical professionals conducting and gathering research, emergency relief task force groups, and corporate groups working on presentations. Basic collaboration tools include the use of Email, instant messaging, voicemail and web publishing. As work groups get more involved and the projects more detailed, more sophisticated collaboration tools become necessary. If you are looking into setting up an effective work group for your industry, here are a few pointers to streamline your efforts. On wireless computer networks, use ad-hoc mode to directly communicate with other computers. Operating in this mode allows all wireless devices within a specified range to communicate in peer-to-peer fashion without the use of central access points. Electronic conferencing – allows for a more interactive way of sharing information. 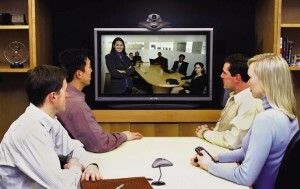 Both teleconferencing and videoconferencing are available, and with today’s technology most providers offer computer to phone access. Electronic meetings are generally set up with an online conference provider that allows participants to phone or log in. Presentations can be viewed and the participants can either speak to each other by phone or chat during and after the presentation. Data conferencing – allows networked computers to view and collaborate from a common whiteboard. Each user can communicate and add to the board during the discussion. File and document sharing – With file sharing from My Docs Online an entire work group can easily organize, store, and manage files. Simply drag and drop files and folders into your online system, collaborate with colleagues across the globe, and view files conveniently from your laptop, iPhone, BlackBerry or other mobile device. Ad-hoc networks make sense when a small group of professionals need to join forces for a common goal. With the right tools and document sharing tools in place, your ad-hoc group can be up and collaborating in minutes.